This salad is easy to put together. One of my favorites. This salad has 3 parts to it that make it great. 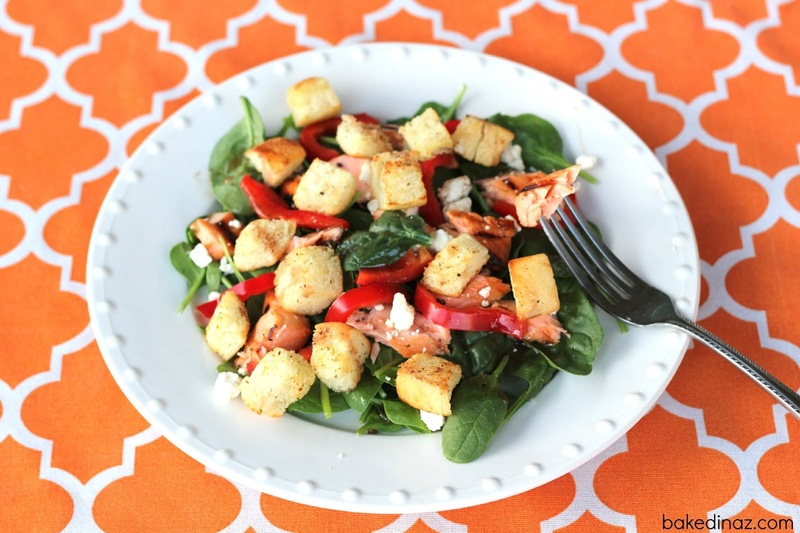 The salmon, the croutons & the dressing. Then we just top the spinach leaves with whatever fresh veggies we have on hand. Red pepper is a a great one on this. Oh, and feta cheese. I just love feta cheese. 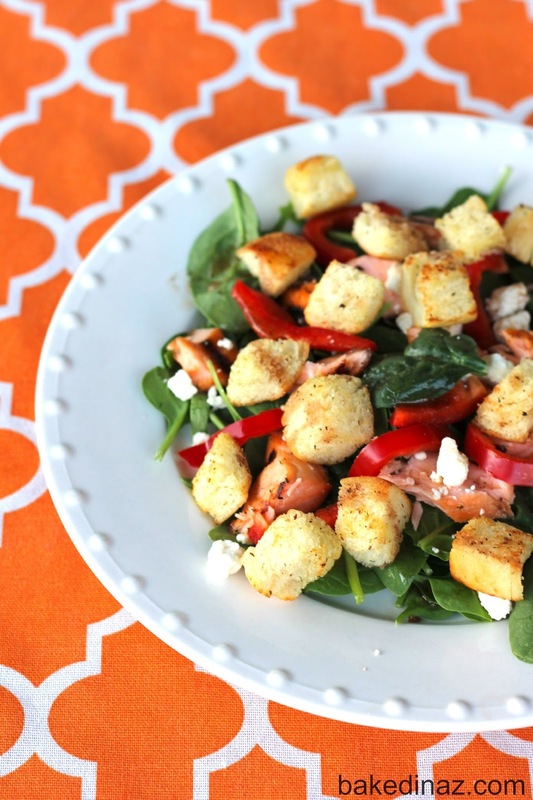 The homemade croutons are amazing. I got the recipe from a good friend. We were over for dinner and she had these croutons on the salad she made. Of course I had to know where she got the delicious croutons! She told me how she made them and I have been making them ever since. Thanks Alyssa! Grill the salmon following the directions in this post. You may wish to omit the glaze and just use the salad dressing. Keep warm by wrapping in foil. 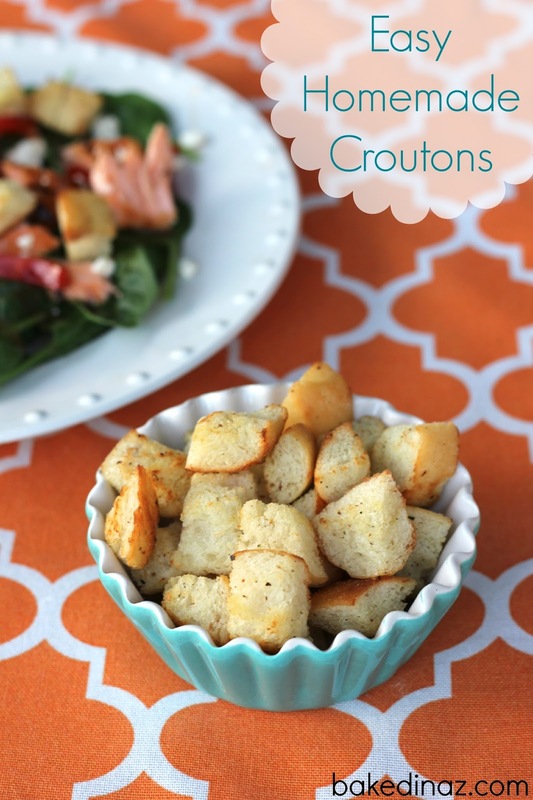 MAKE THE CROUTONS: Slice the bread into 1" cubes. Drizzle the olive oil in a non-stick skillet. Add the bread cubes and sprinkle with the seasonings. Cook over medium heat until the outsides are golden brown. 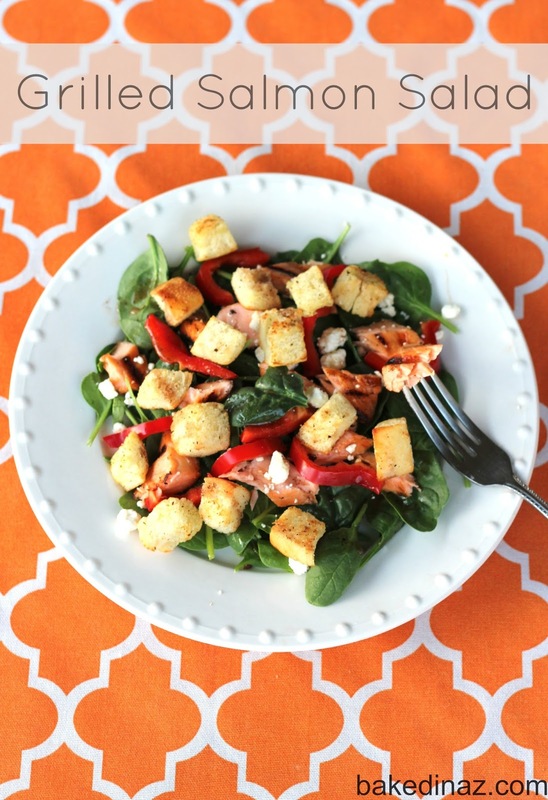 Layer the spinach, peppers, salmon, feta cheese and croutons on a plate. You can use whatever veggies you want on this salad. We have had it with cherry tomatoes, olives, shredded carrots etc. It is very adaptable. I usually omit the glaze when grilling the salmon for this salad because the dressing is so good. The Trader Joe's balsamic vinaigrette is amazing. Our favorite dressing!